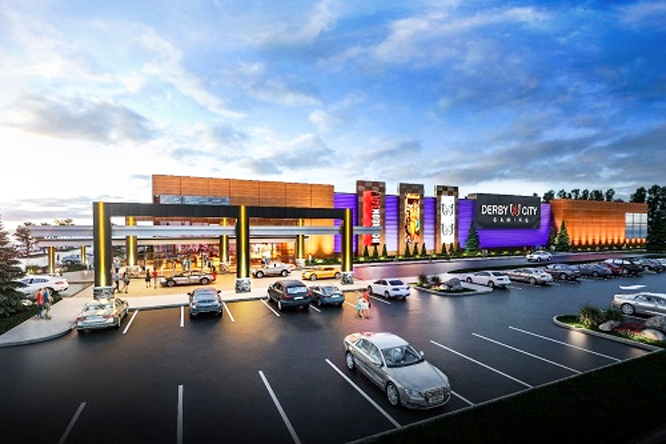 Churchill Downs Incorporated opened the new Derby City Gaming in Louisville, Kentucky this past September. The historical racing machine facility is an 85,000-square-foot, $65 million complex featuring 900 state-of-the-art historical racing machines; two quick-service, walk-up food venues; and a bar with seating for fifty and large format televisions for guests to take in all the best sporting action year-round. To complete this winning project, a number of outdoor signs were needed, including channel letters, three digital wall signs, and a double-sided monument with a digital sign. To handle the sign work, Churchill Downs brought in Rueff Signs of Louisville, Kentucky. This was no gamble as Churchill Downs has worked with Rueff Signs on other past sign projects. Rueff Signs has been in business since 1912, when Project Manager Carl Rueff’s great-great uncle started up the business. He convinced his brother, Carl’s great-grandfather, to sell his grocery store and get involved in signs, and the rest is history. Today the family-owned, full-service sign company can fabricate and install just about any sign and even still fabricates and restores neon signs. The company specializes in large and unique custom signage and has done everything from monument signs to custom sign cabinets and letters to large channel letters on high rises. The project for Derby City Gaming required them to put some of that custom work and problem solving to good use. Rueff Signs was tasked with supplying and installing five sets of channel letters—two sets on the monument sign, three freestanding sets at the entrances, and one large main set on the building façade. The sign shop was also responsible for gathering bids for the digital signage elements—three digital wall displays and one double-sided digital sign for the monument—and presenting them to Churchill Downs for selection. Also involved in the project were Calhoun Construction, which served as general contractor on the job, and Matriarch Sign Solutions, which designed the aesthetic aspects of the signage elements. Rueff Signs made decisions on what materials to use, how to bring electric to all illuminated components, and the engineering on how to install the signs. Rueff Signs hand-formed all five sets of channel letters out of aluminum and painted the returns black with AkzoNobel Grip-Gard paint. The sign faces were fabricated out of white polycarbonate. Colored translucent ORAFOL vinyl was applied to the sign faces for the rose and horseshoe portions of the channel letter sets. White Principal LED Fusion CL 3™ modules were used in all five sets of channel letters. On the largest set—where the letters measure five feet, six inches tall—double the amount of LEDs were used to make them brighter. The largest set of letters also required special UL listings. “We had to get individual UL listings for each one because each one had its own power supply—they weren’t on a raceway or anything,” explains Rueff. “They all had power supplies internally mounted. And then we had to do the wiring from the outside because [Derby City Gaming] had a finished wall on the inside. Installing the large channel letters was also a unique process because the façade was made of materials from Trespa, a premier developer of high-quality, high-pressure laminate panels for exterior cladding and decorative façades. To install the large set of channel letters, Rueff Signs used its 57-foot SkyHoist SX57 with a two-man basket on a 2009 International truck. For the three sets of freestanding channel letters, Rueff Signs built custom four-by-four-inch raceways for attachment, and the shop installed those raceways to a steel structure that was provided by Calhoun Construction. For the monument sign, Rueff Signs was responsible for installing the digital sign as well as creating and installing the sets of channel letters on each side. Calhoun Construction fabricated the monument from white brick, while Rueff Signs attached the two sets of channel letters to the brick monument with Tapcon® fasteners. For the installation of the 15-foot-high-by-10-foot-wide, double-sided 10mm digital sign from ThinkSIGN, Rueff Signs lifted each face into place on a steel structure. “That was attached with 90-degree painted steel angles, and then we attached ThinkSIGN’s angles onto that. So we had to get precise measurements so that their LED cabinets would line up,” says Rueff. 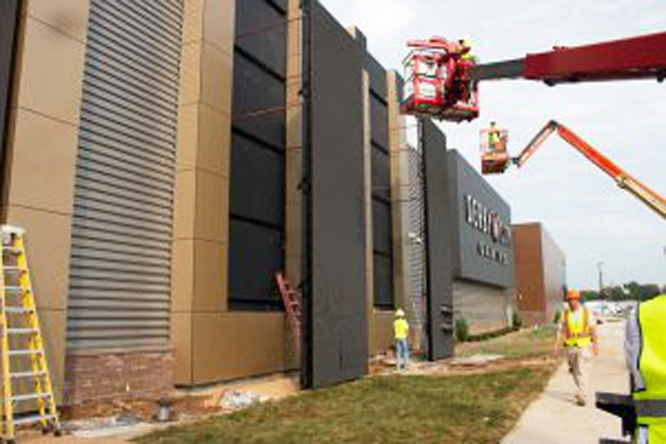 The digital displays on Derby City Gaming’s façade proved to be the part of the project that required the most ingenuity. 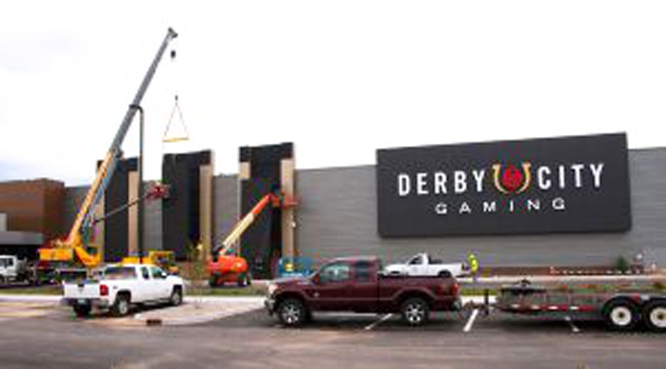 The challenge then lay in figuring out how to attach the three digital signs into recessed spaces on Derby City Gaming’s façade. Rueff Signs and Calhoun Construction decided to use a cleat system. Further adding to the challenge was that the digital displays were a modular system, and each of the three displays had to be assembled from four sections. They couldn’t be built on the wall since it was a recessed space. Since the signs weighed approximately 3,000 pounds each, Rueff Signs had to use an industrial crane from Maxim Crane Works to lift them into place onto the cleat system. “On the wall, we had five receiving angles—two of them were 90-degree angles and three of them were 45-degree angles,” says Rueff. “The three in the middle that were 45-degree angles acted as cleats and caught the display and kept it there. Those angles had to be that way, because you couldn’t bolt once we installed it. So there had to be something that kept it in place, and that’s friction and gravity on those 45-degree angles. And then the top and the bottom are the 90-degree angles where we could put bolts. As if the install wasn’t challenging enough, installers had to finish the last digital display in the rain. ThinkSIGN had already walked Churchill Downs’ marketing team through the pixel matrix of their new sign configurations, so once the displays were up and running, Churchill Downs had content ready to go. In the end, the signage project may have been challenging, but it was a winning bet for all parties involved. “It took a lot of communication and a lot of teamwork and collaboration between Calhoun, Rueff, and ThinkSIGN to make sure this went up on time and accurately,” says Hughes.